RIM’s BlackBerry World passed nearly a month ago in Orlando, Florida, but reverberations from the forum still sound off. Investors in the Canadian phone maker are growing more and more concerned about the future of the company and talks about radical change in the top management tier of the company start to gain popularity, according to a report by Reuters. Just recently, we reported about a class-action lawsuit against RIM after investors felt misled by overly optimistic prognosis by the phone maker. "These guys are very emotionally invested, taxed for time, and feel the pressure of being left behind and seeing your market fade away," said an investor supportive of the possible change. RIM founder Mike Lazaridis has been in the company since day one, and co-CEO Jim Balsillie joined the Canadian company shortly after Lazaridis, but this might be the exact reason behind the slow pace at which ‘Berries enter the smartphone world. To add to the heat, investors cast a vote of no confidence on RIM’s product strategy including products like the BlackBerry PlayBook and new ‘Berries on Friday. The company has been staging attempts to transition its lineup to a QNX-based platform, which should bring contemporary looks and feel to BlackBerries. "It's a super-exciting transition. And it's got legs to sustain us really indefinitely," Balsillie defended the company’s current plans. But even with those plans, investors have criticized the fact the timing of QNX-based devices has been announced nearly a year before they hit mass market, which would negatively impact sales of the company’s current lineup. Missteps like this one, have prompted analysts and investors to openly speak about a change. "They're stuck in the past. They know what worked and keep playing that card and it's not working any more, and they don't seem to have any ideas," Charter Equity analyst Ed Snyder stressed. But with capitalization of the Canadians reaching some $23 billion, analysts estimate that it will take not less than an investment of $1 billion to spur debate over such a change. Do you think that it's a change of chief executives that would help the company regain its past glory? Let us know your opinion in the comments below. Anyone who supports Blackberry, even if it is just from afar, has agreed that top Management is poor and unimaginative. Oh God yes! They need to step down. Not that I think it will save them, but anything is better than these two at this point. 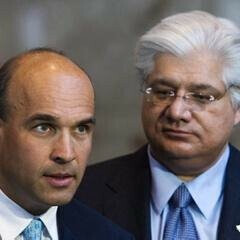 Jim Balsillie isn't that bad actually, however Mike Lazaridis needs to step down immediately. As the company has gone down in, well basically everything this year he's done nothing but make it worst. In the end, I think blackberry will eventually go down to a low point, gain a lil back from making BBM on all smartphones as a last resort, then be bought out by one of the other companies eventually. Which is sad considering they dominated the market for so long. But with Android phones outselling Apple, RIM and Microsoft phones combined so far this year, there's no question who is dominating now. lol, ive said multiple times on this site that blackberry management needs to be ripped out of RIM and replaced.. all of the top dogs. They need agressive blood and they need to launch QNX NOW. Blackberrys sync email better than anyone. But ya know what.. Everyone does it darn well now for the most part. That one stand alone feature isnt enough to keep carrying the platform.. especially as far behind that they are in other categories. The reason I commented that it might be time to start discussions with HP about a strategic 'partnership' is because RIM has basically lost the market. Unless their new handsets are leading the pack (which given past performance, I rather doubt), they won't get another chance. Corporations are making decisions about what handsets will be approved going forward right now (as opposed to next year). Android and iOS have managed to get to the point where they are viewed as comparable to RIM in the security department; that being the circumstance, what is there to keep them off the list of 'qualified' handsets? RIM might be able to grab a point or two of market share for one or two months by giving handsets away, but long term, the trend is headed south (along with their share price). Time to look for a strategic 'partner'. HP? That sounds worse than Nokia selling out to Microsoft. If RIM can get the new OS and handsets out sometime in Q3 they can rebound. Maybe I am old fashioned but all the apps and large screens mean nothing when the battery cannot last through the work day. HP wouldnt do it. They just invested in palm. Microsoft is on the table to buy them for patents, which means Apple or Google might try that as well. Any strategic partnership with them will be with some yet unnamed company. Maybe Asus or Acer or something. Who knows. If RIM can get the next generation of phones out in Q3 I think they will regain some marketshare. I have tried many Android phones over the past year and none of them get the basics right. My BlackBerry Torch has much better signal reception, battery life, calendering, messsenging and app integration than any of those phones. Yes, the screen is still small, the CPU struggles on graphics heavy web pages and there is no Adobe Flash support. But I went back to the Torch beccause it gets me through the day withough humting for a plug and does alll the basic tasks very well. I can wait for the new OS. But, maybe other people will be seduced by the glitter of Android or iOS. this is a necessity. Blackberry management still treats smartphones as though the Iphone and Android phones dont exist. Blackberry needs just a little bit of innovation to bring them back on the track. And this is what the top management is not thinking about. Hope they understand it soon.